I don’t eat a lot of meat nowadays ever since I started to cut back on it two years ago, but if you were to ask me, lamb still remains one of my favourite meats out there. It’s incredibly tender and packed with so much flavour. After a long week and being forced to eat leftovers that I dug out from my freezer (which goodness knows how long they’ve been sitting in there…), I decided to give myself a little treat. 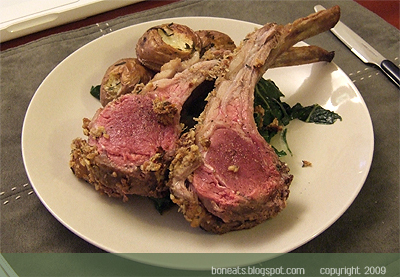 A few months ago, I made rack of lamb with a classic breadcrumb crust, but decided to change things up by using walnuts instead. It gives an equally crispy exterior, with a touch of sweetness from the walnuts, which is a nice balance to the saltiness of the mustard and the parmesan. Served the lamb on a bed of Swiss chard sautéed in olive oil, garlic and red chilli flakes, along with some rosemary potatoes that were roasting beside the lamb. Rack of lamb may seem daunting if you’ve never cooked it before, but it’s incredibly easy to make. So give this one a whirl for a fancy dinner that’ll surely impress your guests! Place walnuts, crackers, garlic, and herbs into the bowl of a food processor. Give the food processor a whirl until the nuts are a medium to medium-fine grind. Place nut mixture into a dish and stir in the Parmiggiano-Reggiano. Set aside. Rinse the rack of lamb and pat dry with a paper towel. Score the layer of fat and season the lamb with salt and pepper. Heat the olive oil in a heavy pan over medium-high heat. Sear the lamb on all sides until brown all over. Remove from the heat and brush with Dijon mustard. Press walnut mixture into the mustard-coated lamb, patting it down to ensure that it sticks to the meat and shaking off any excess nuts. Bake in the oven for about 15 to 20 minutes for medium-rare, or until a meat thermometer reads 140-150°F. Remove from the oven, cover with foil and let rest for 10 minutes to allow the juices to disperse throughout the meat again. Cut into individual chops and serve! Posted by Bonita at 11:32 a.m. Tangled Noodle October 30, 2009 at 11:07 p.m.
Bonita October 31, 2009 at 10:44 a.m.
Roadfood junkie November 3, 2009 at 12:22 a.m. The first time I ever ate lamb was in a Greek upscale restaurant. I was hooked, and it is my go to dish when fine dining. Unfortunately the cook of the house does not eat lamb so it never gets as far as the shopping cart.